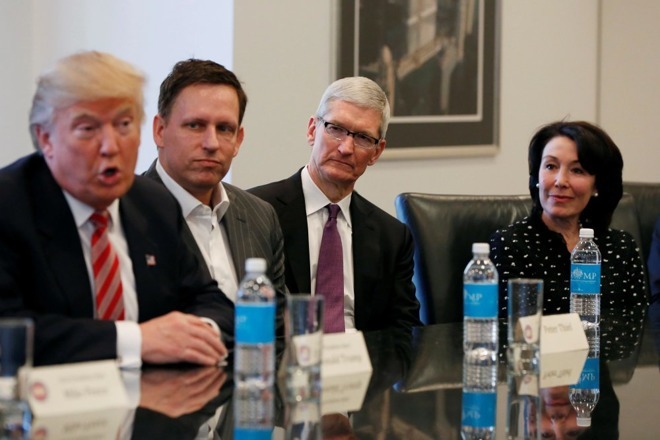 The U.S. Department of Commerce today announced the 25 members of the Trump administration's new American Workforce Policy Advisory Board, including Apple CEO Tim Cook and IBM CEO Ginni Rometty. The advisory board's recommendations will help guide the National Council for the American Worker's efforts to establish a strategy to ensure that American students and workers have access to "affordable, relevant, and innovative education and job training that will equip them to compete and win in the global economy." The board, co-chaired by U.S. Secretary of Commerce Wilbur Ross and Advisor to the President Ivanka Trump, is expected to help address a "skills crisis" due to the rapidly increasing use of technology, automation, and artificial intelligence that is shaping many industries across the United States. President Trump established the National Council for the American Worker in July 2018 to "create and promote workforce development strategies that provide evidence-based, affordable education and skills-based training for youth and adults to prepare them for the jobs of today and of the future." In before the slew of anti-Tim-in-politics comments. I see it only as good thing to have someone with Tim's experience and perspective on any board the Trump administration is managing. It’s hard to imagine that such a short post could be so wrong. Crediting Trump with the current economy is like giving a bluebird credit for spring. The economy was on the upswing when Trump took office, and it has continued its upward trend since then, as economy’s tend to do. Most of the heavy lifting was done during the previous administration. Economies work at a glacial pace. Trump is not the cause of our current economy, he is along for the ride. The impact of his policies will be felt in a few years. And considering that we now have the highest debt in our history, and that a crash of some sort is likely coming in the near future, his economic legacy will likely be similar to George W Bush’s. And regarding Tim Cook, your assessment couldn’t be further from the truth. During his tenure, Apple has become the most profitable company in the history of American corporations. His economic performance has been nothing short of stellar. Yeah that government shutdown really helped boost the GDP. Let’s have another. Tim really reminds me of Beaker from "The Muppets" in that photo. I mean, it's all a dog and pony show. Does anyone really think some board of extremely wealthy CEO's is going to do anything to improve conditions for American workers? A list of names on an article and a fancy luncheon that probably cost more than some kid's college tuition. That's all these advisory committees ever seem to amount to. Not a Trump fan, but WTF are you talking about? The debt nearly doubled from 10 Trillion to 19 Trillion under Obama. It's gone up 3 trillion under Trump so far. My math skills may be a bit rusty, but 3 trillion is a lot smaller than 9 trillion. CNN told him "Orange man bad"
Hard to know which statement is funnier.